Teachers can instruct students on the characteristics of linguistic texts in order to facilitate students’ ability to find and retain information. Students can identify each of the five text structures by examining a text for signal words and phrases. Once students have identified text structures in a passage, they can use their knowledge of those structures to help them determine the main ideas and key details of the text. 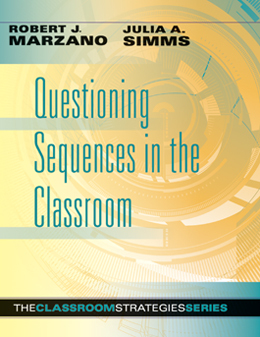 A questioning sequence involves four phases of questions. The detail and category phases activate students’ background knowledge about the instructional goal. Argumentation (making and defending claims) is the focus of the elaboration and evidence phases. When students go beyond their knowledge base to answer a question, they often have to consult outside resources, such as linguistic texts, before coming to a conclusion. Teachers can prepare students for successfully finding, remembering, and understanding information in linguistic texts by teaching them about text structures. Text structures show how elements of a text interrelate and also act as blank organizers that students mentally fill in as they read. By using text structures to frame their thinking about texts, students are more able to recognize patterns and pick out important details in the texts they encounter. Even after students have completed their reading, research shows that students will recall ideas from a passage better if they used a text structure to help them organize their understanding of the topic (pp. 33–34). There are five primary text structures that are used to classify linguistic texts: (1) description, (2) sequence, (3) causation, (4) problem/solution, and (5) comparison. Each text structure demonstrates different relationships among the main ideas, details, and sections of a text and may be associated with a particular genre or text type. While text type can act as a clue to the kind of structure being used, signal words and phrases within the text can also indicate the use of a particular text structure. For example, if a student notices that a text contains the words “first,” “next,” “before,” and “finally,” she could conclude that the text is employing a sequence text structure. Students can design their own lists of text structure signal words and phrases to help them quickly and easily identify the structure at work (pp. 34–35). Text structures, in addition to being organizational tools, can also inform how students interpret the main ideas in a text. Since a text structure represents a pattern of relationships, students can use a text’s structure to predict which elements in a passage are the most important. For instance, a student reading a text with a comparison structure will know that he needs to identify the two objects being compared and find details in the text that show how the two objects are similar and different. Teachers can encourage students to further engage with text structures by asking them to retell or summarize passages using the specific information they gather related to the text’s structure (pp. 37–38). Each phase is as important as the others, and together the phases move students toward making authentic claims and providing evidence for them, the heart of argumentation. Questioning sequences should be based on the established instructional goals for a unit, which are derived from a set of standards (p. 14). Questions about details should be designed to carefully and accurately draw out and develop students’ knowledge base about specific topics. Teachers can select any category that a detail fits into, depending on their instructional goals. If the learning goal highlights several categories, the teacher may want to divide students into groups, allowing each group to focus on one category as they proceed into the third and fourth phases of the questioning sequence. There are three types of category questions teachers can use: (1) asking students to identify examples in a category, (2) asking students to describe general characteristics of a category, and (3) asking students to make comparisons within and across categories (pp. 15, 20). Elaboration and evidence questions are particularity important in developing students’ abilities to make and defend claims, a process often referred to as argumentation. Creating claims and defending them with evidence is an important skill highlighted in the Common Core State Standards (CCSS). During the elaboration and evidence phases, students engage in critical thinking by elaborating on the information surfaced during the first two phases (pp. 24–25).